Let’s discuss these two boards, and what makes them different. There is the true blue Penny on one hand, and the lower cost Kryptonics on the other. 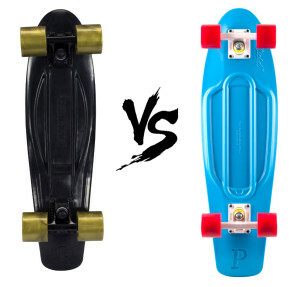 If you are comparing the two, it is probably because you want a Penny style board without the full price. That’s a valid concern, and here we are going to take a look at both and explore the differences in construction and handling that make the difference in the price. made of a proprietary plastic blend that promises a strong, but flexible platform. These boards are coming from the manufacturer at a little under 100 dollars, and are ready to go once received. Included with the board are 59mm 83A moderately soft wheels that ride on Abec7 bearings. Competitors have a lot to live up to, in terms of the great performance and aesthetics that Penny offers out of the box. Kryptonics offers the Torpedo. It is a fair sight cheaper from the initial purchase, and as such as many people asking if the difference is worth the price. This is a semi-rigid board molded in polypropylene that comes in at 40 to 50 bucks. The Torpedo comes ready to use with 62mm 83a wheels mounted on Abec5 bearings. Like the Penny, these boards come in a variety of colors and finishes. Such a large difference in the price has to come from somewhere. For starters, the Abec7 bearings on the Penny are more expensive. For casual users, the difference in Abec5 and Abec7 can be a little modest. Abec5 are good quality bearings that offer good performance and the sensation of low friction, while the Abec7 bearings offer a near-frictionless sensation. So, there is a part of the difference- better bearings out of the gate. Another difference is the actual handling of the board. It is not quite an easy thing to talk about the differences in handling. Overall, people that try both seem to keep coming back to the Torpedo being a bit more sluggish to turn. If the Torpedo’s handling is an issue, the trucks can be bushed or replaced. All in all, the Kryptonics Torpedo is a solid board for beginners, or people that just want a little board to cruise around on. The Penny comes with higher-grade bearings and better trucks, but the difference in price is enough to have two Torpedoes in the place of one Penny.